After a very long time (a year and a half! ), I finally have a PC! Well, a netbook, but for OA it serves it's purpose. It runs pretty smooth. So I've decided to finish many of the things I had in mind before doing my works for the OACMP and OA3. This one is a fun map. It's not meant to be included into OA or the Community Mappack. I'll upload this one to MapRaider once it's finished. I've started it when I've learnt how to map, circa 0.8.0, surely before 0.8.1. It spent a very long time being frozen, but I'm pulling this one out of the archives to try and give it a finish. 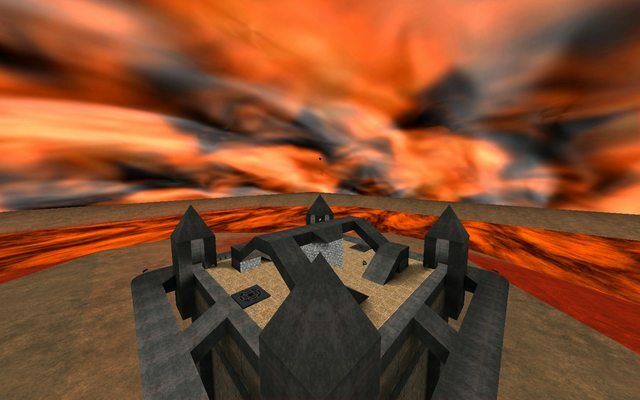 In that time it was inspired by Mortal Kombat vs. DC Universe's "Freefall Kombat" mechanic. Now I'd call this level "OA meets Super Smash Bros". 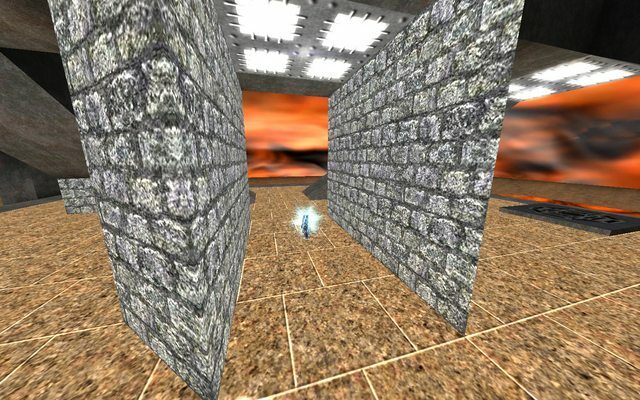 The premise of the level is a battle at the top of a tower, akin to Unreal Tournament's DM-Morpheus or UT200X's DM-Plunge/BR-SkyLine, but without the low gravity. Falling to the lower level takes part of your health and can kill you if you don't find any door quickly. It can support up to 4 players. More players is just too chaotic. - Getting pushed out of the level frags you. 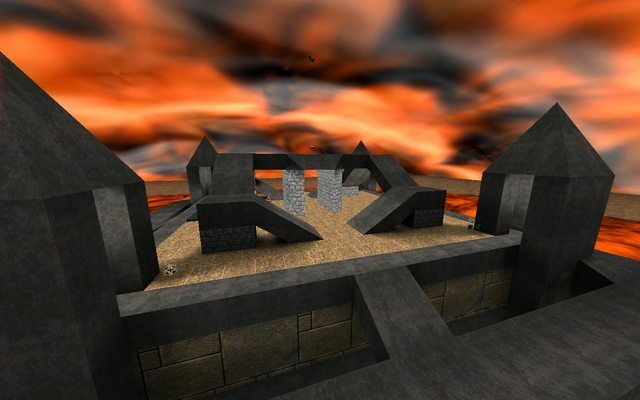 - The spawnpoints are reasonably lifted from the floor, as to give the "SSB Spawn" effect. 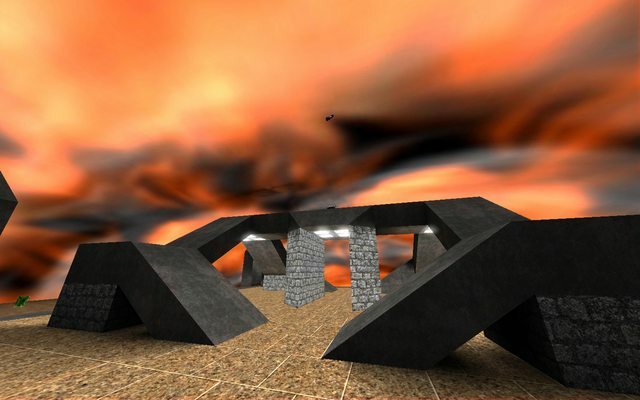 - Players start with push-friendly weapons (Railgun, RL, GL, Plasma, Prox), armor and full health. There are some health/armor pickups, the Quad, and a BFG which only the most patient players can catch. - Intermission point is placed in such a way that the entire upper level is seen. - Skybox! (Not a skydome) I'm experimenting terrains with simple patch meshes. I'm aware of other methods being better, but for simple terrains they may serve for the purpose. Some screenshots. D/L coming soon. I have to redesign it from scratch. It turns out that the size itself is causing problems. It's a pretty huge (and almost unscalable) map. Plus, the arena has a very horizontal gameplay. The basic idea is that everyone fights atop of a tower. Only weapons present in the map are explosive/knockback weapons. It was inspired by Super Smash Bros and its method of scoring: instead of depleting someone's lifebar, you just do enough damage to them until they are as lightwieght as a balloon and push them out of the stage. 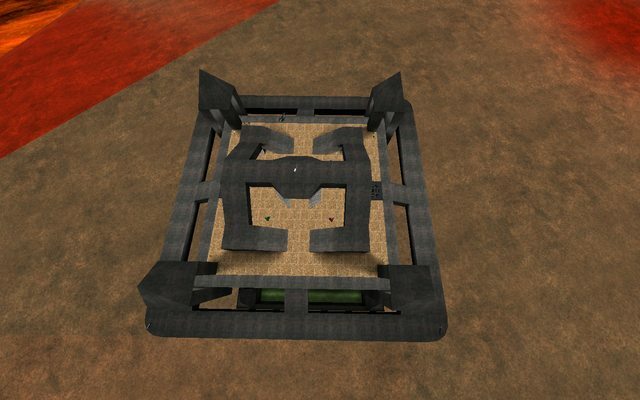 In this map the idea is to rack up frags both with the usual method and with pushing enemies. Supports FFA, LMS, 1on1 and Possession. Weapons present in the game: Grenade Launcher, Rocket Launcher, Plasma Gun, Railgun (absent in Possession), BFG and Prox Launcher. Available powerups: Quad Damage. Some known bugs: the skybox, some areas need refinement, some bugs with the push triggers to the death zones, and OFC the jumppads leading to the BFG. Even as a "fun" map, I still want to get the layout first. - Jumppads sometimes cause you bump your head on the ramp. - Maybe you don't fall out as soon as expected? Not really an issue. Yep, I've already mentioned the BFG jumppads to be one of the things to fix. Also I need to redo the triggers. All of them.